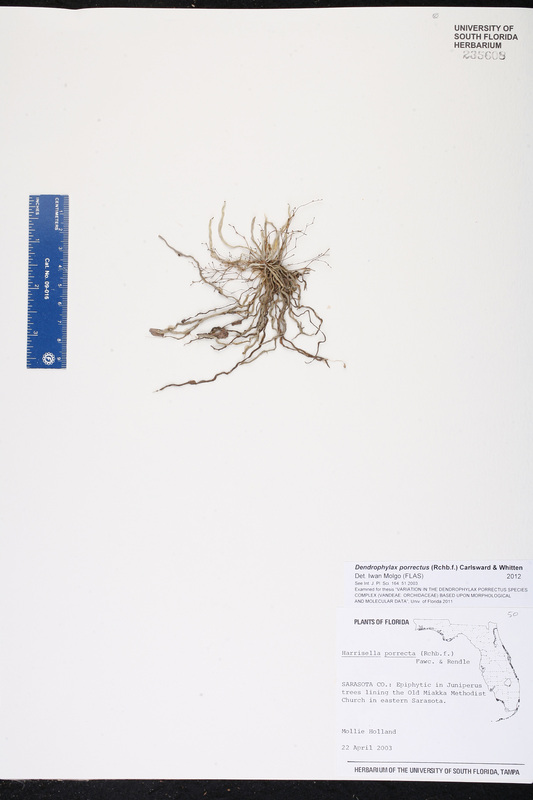 Locality: Dominican Republic. San Juan. 4 km N of Guanito. Habitat: Thorn scrub on hillsides. Locality: Dominican Republic. San Rafael. Bánica, on Cerro San Francisco, 0.5 km from Bánica. Habitat: High forest on limestone hill. 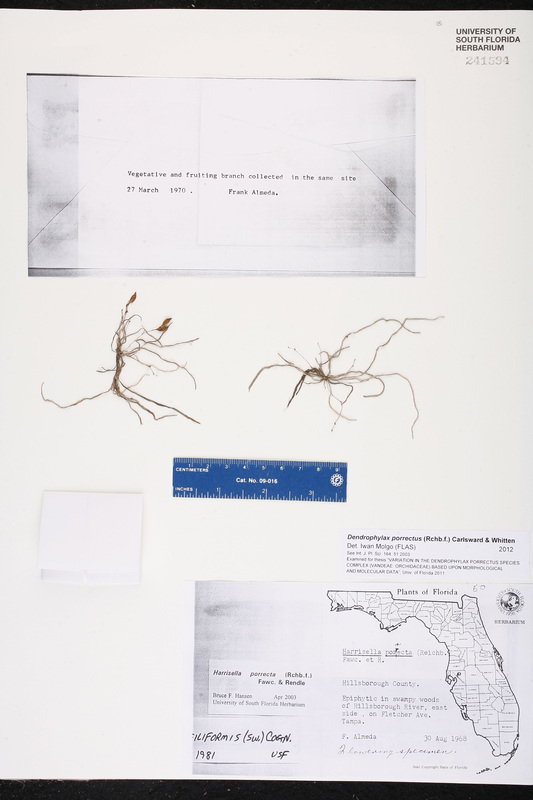 Locality: Florida, Hillsborough Co., Contact USF Herbarium if additional information is required. 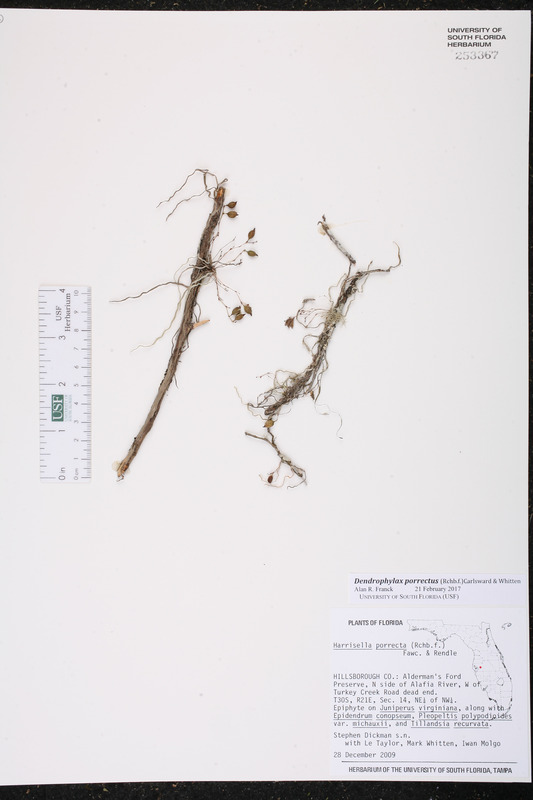 Description: Epiphytic on Juniperus virginiana; plants with capsules on fallen branches below tree. 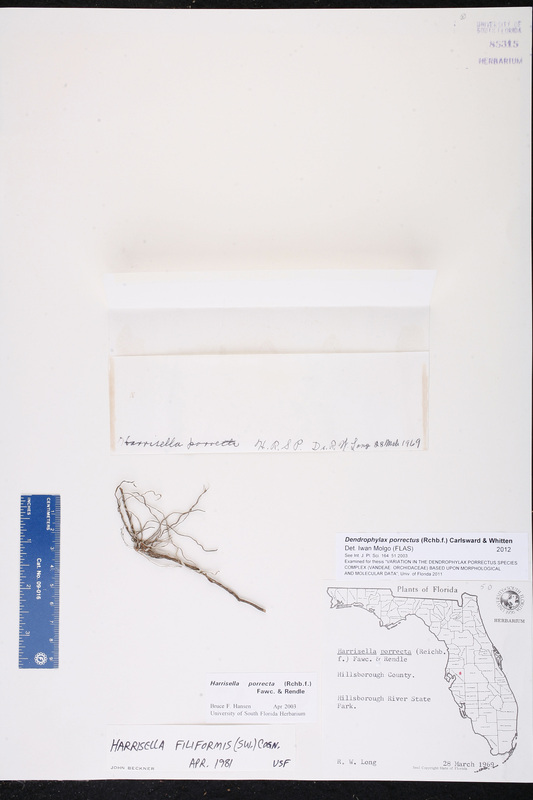 Locality: Florida, Collier Co., Contact USF Herbarium if additional information is required. 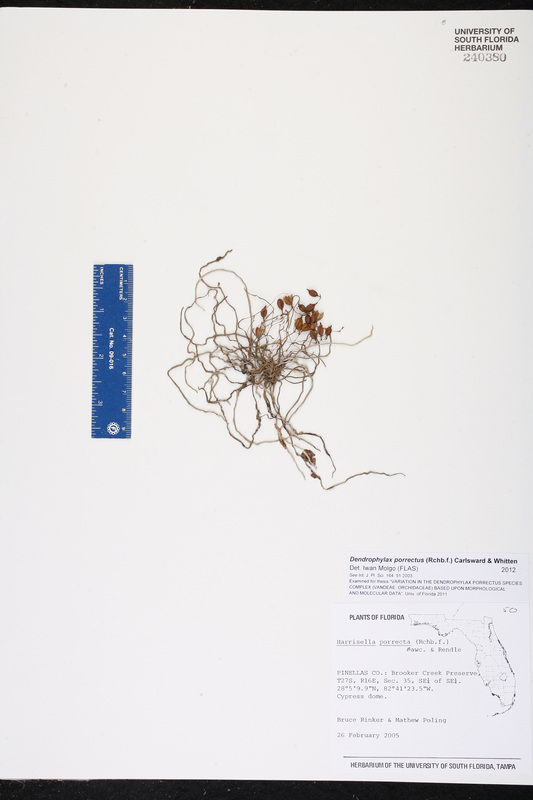 Description: On Juniperus virginiana, with Epidendrum conopseum, Pleopeltis polypodioides var. 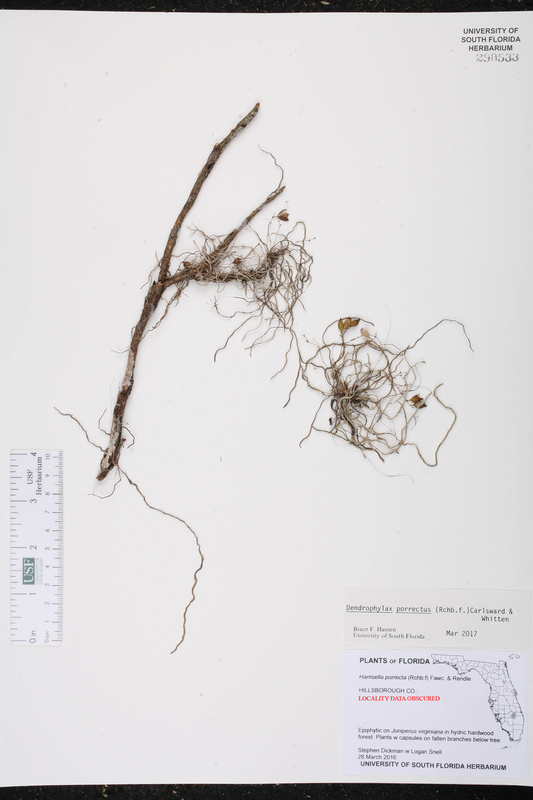 michauxiana, and Tillandsia bartramii. 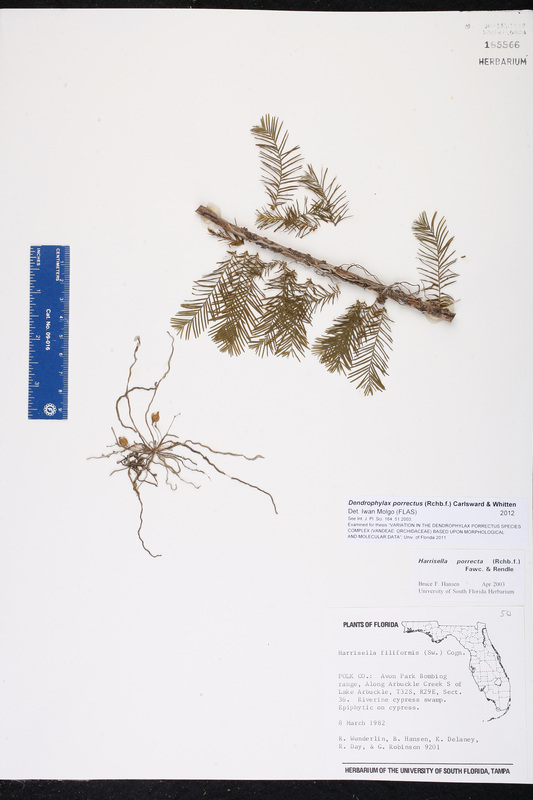 Description: Epiphyte on Juniperus virginiana, along with Epidendrum conopseum, Pleopeltis polypodioides var. 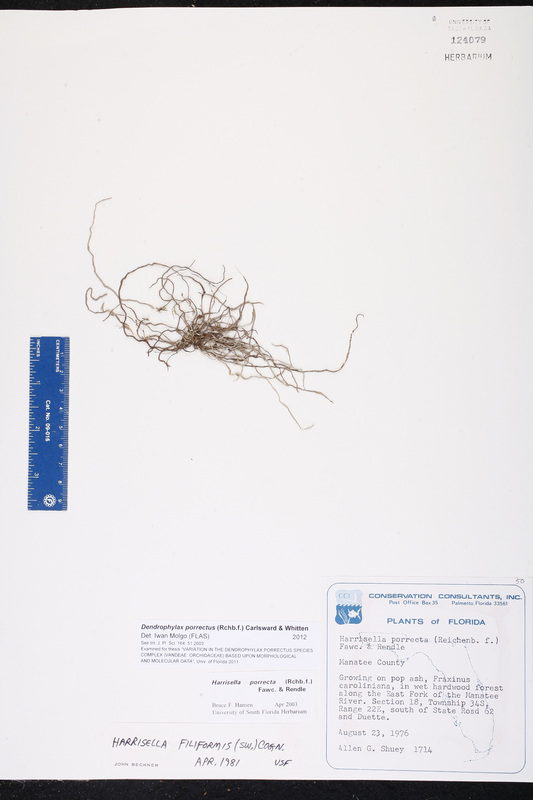 michauxiana, adn Tillandsia recurvata. 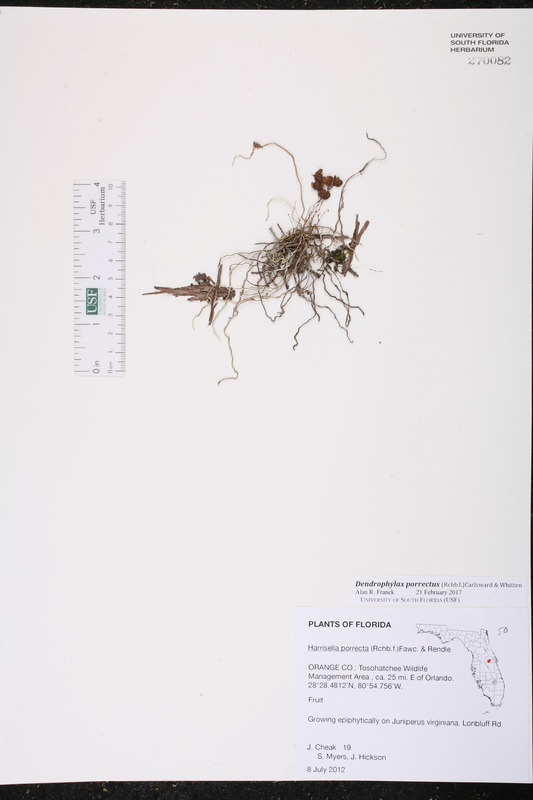 Locality: Florida, Glades Co., Contact USF Herbarium if additional information is required. 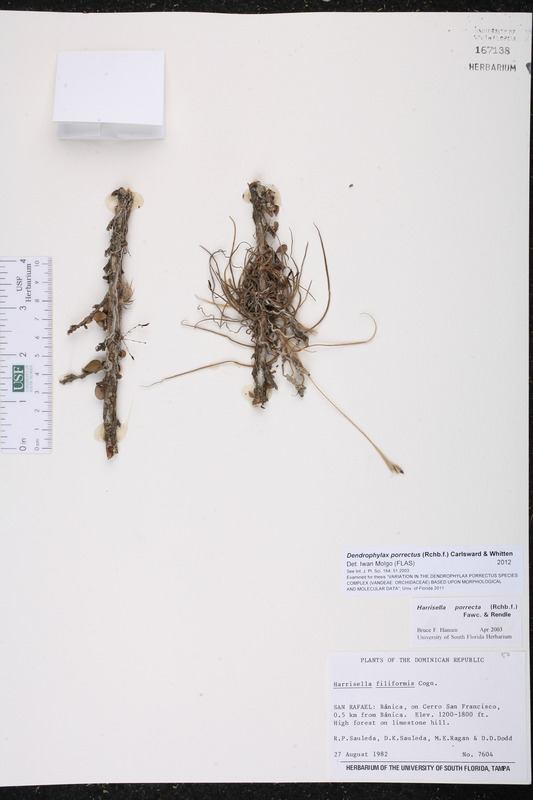 Habitat: Along creek in floodplain swamp. 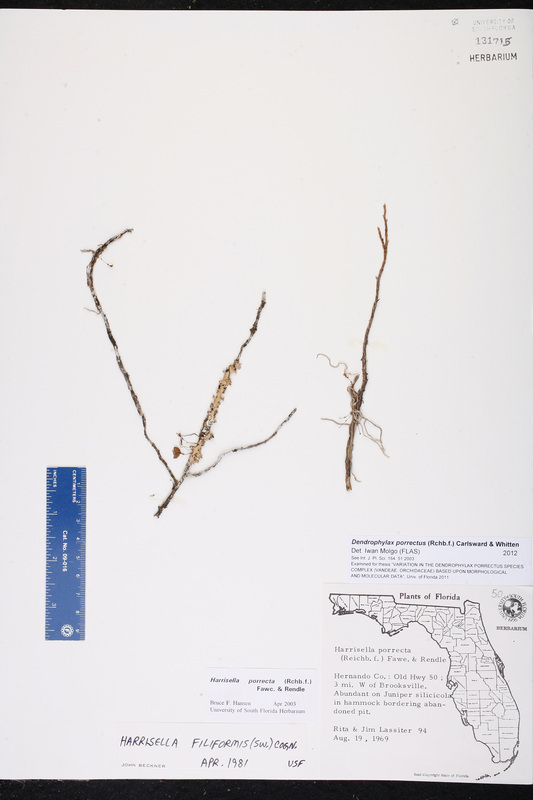 Locality: Florida, Lee Co., Contact USF Herbarium if additional information is required. 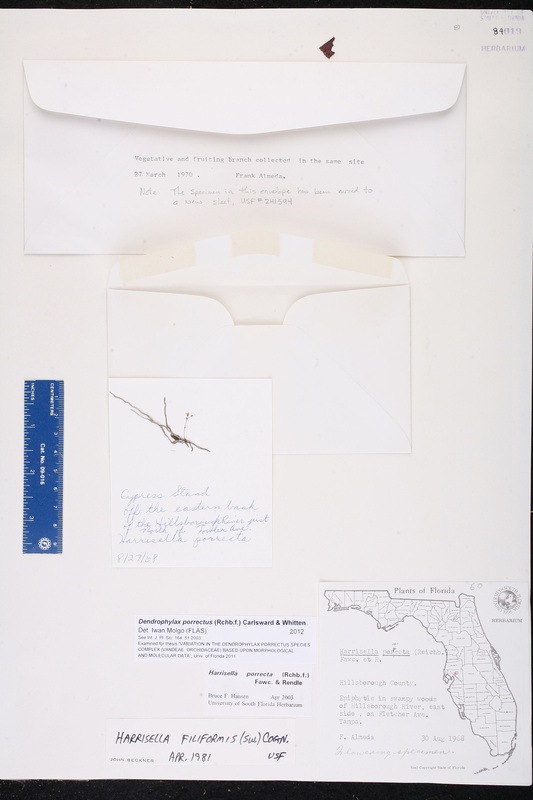 Locality: Florida, Orange Co., Contact USF Herbarium if additional information is required. 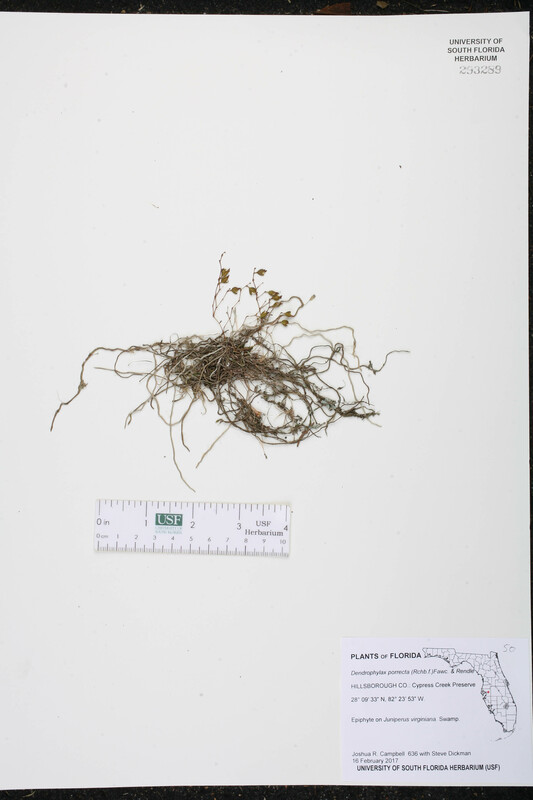 Description: Epiphyte on Juniperus virginiana. Habitat: Edge of slash pine (Pinus elliottii) - cabbage palm (Sabal palmetto) hammock. 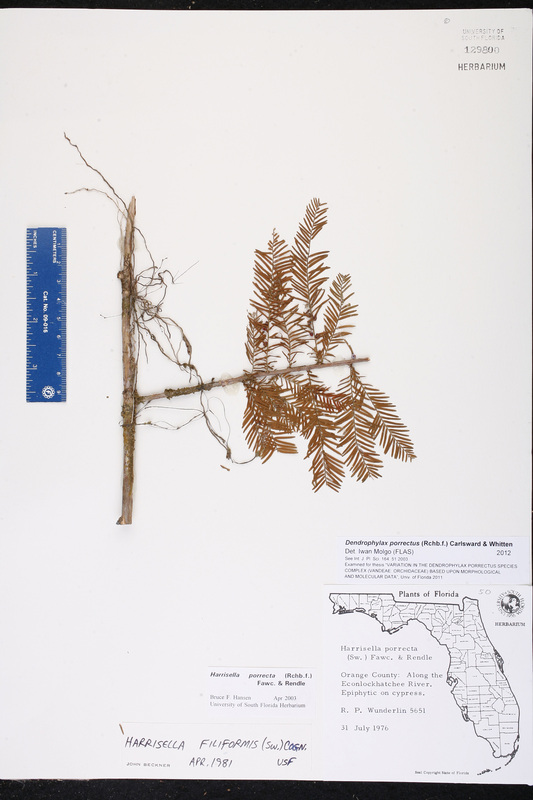 Locality: Florida, Polk Co., Contact USF Herbarium if additional information is required. Habitat: Riverine cypress [Taxodium] swamp. Habitat: Dense low hammock with royal palms [Roystonea regia]; on dead or stunted pop-ash [Fraxinus caroliniana] in full sun. with R. Lassiter, et al. 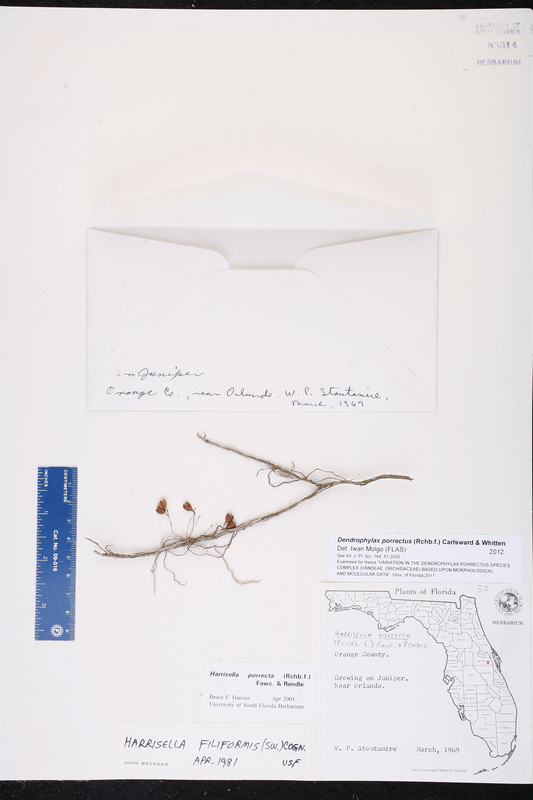 Locality: Florida, DeSoto Co., Contact USF Herbarium if additional information is required. 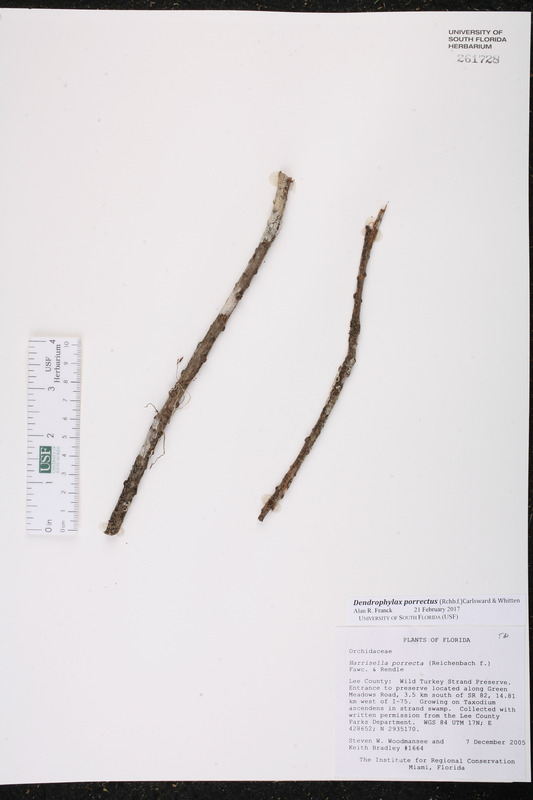 Habitat: On pop-ash (Fraxinus caroliniana) in mixed mesic-hydric forest. 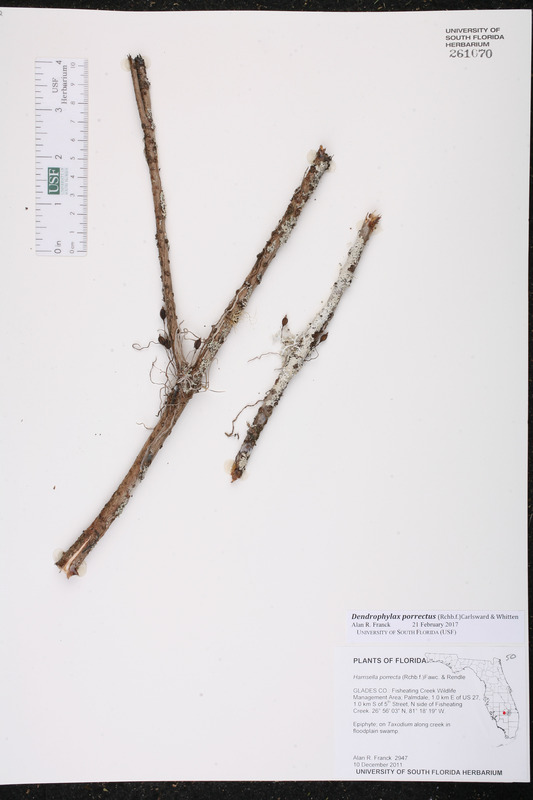 Habitat: On bark of Walter's viburnum (Viburnum obovatum). 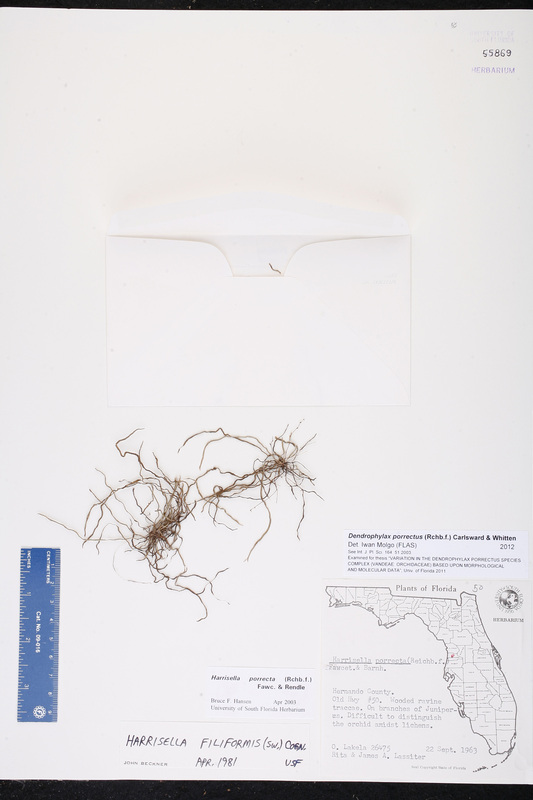 Locality: Florida, Hernando Co., Contact USF Herbarium if additional information is required. 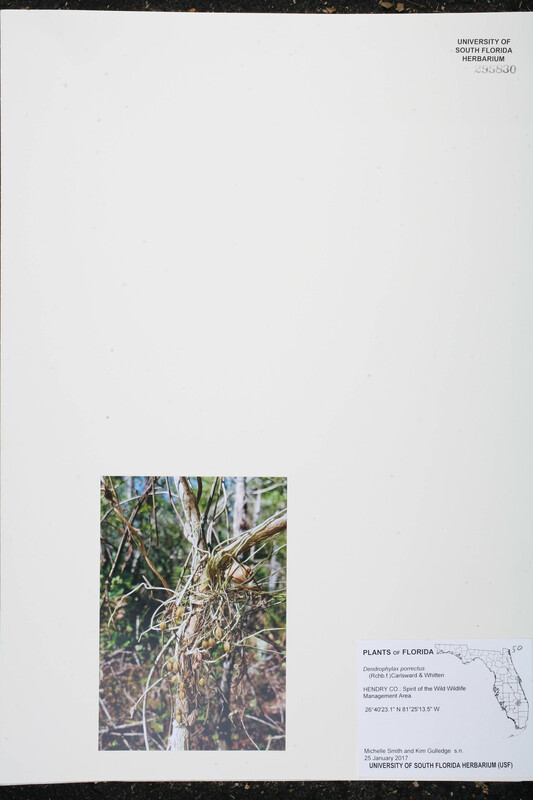 Habitat: On branches overhanging ravine bank, amidst Tillandsia, mosses, and lichens. 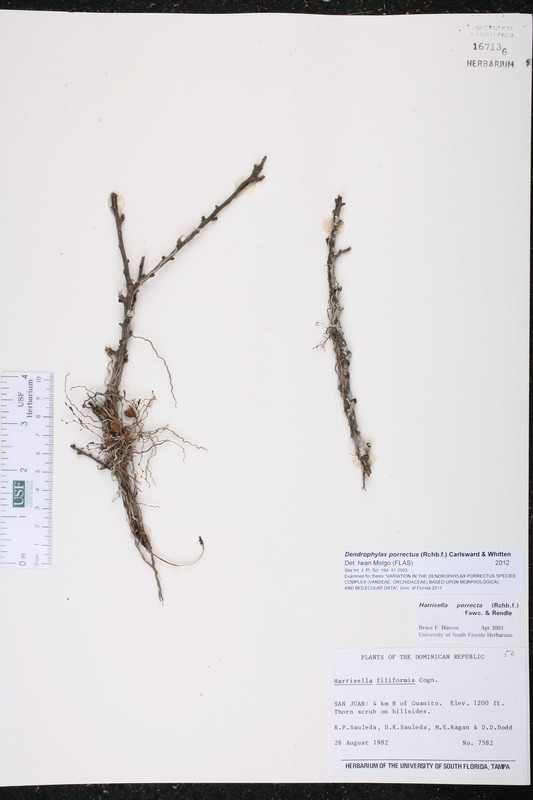 Habitat: Wooded ravine terrace, on branches of Juniperus; difficult to distinguish the orchid amidst lichens. 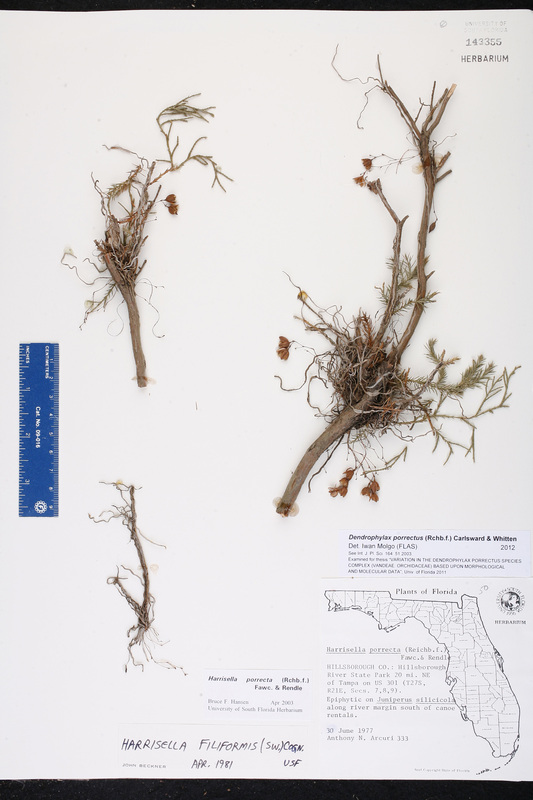 Habitat: On Juniperus silicicola [J. virginiana] in hammock bordering abandoned pit. Habitat: Open shade of large trees, Quercus, Liquidambar, Pinus, Juniper; grassy ranch, foot of slope; on Juniperus trees. 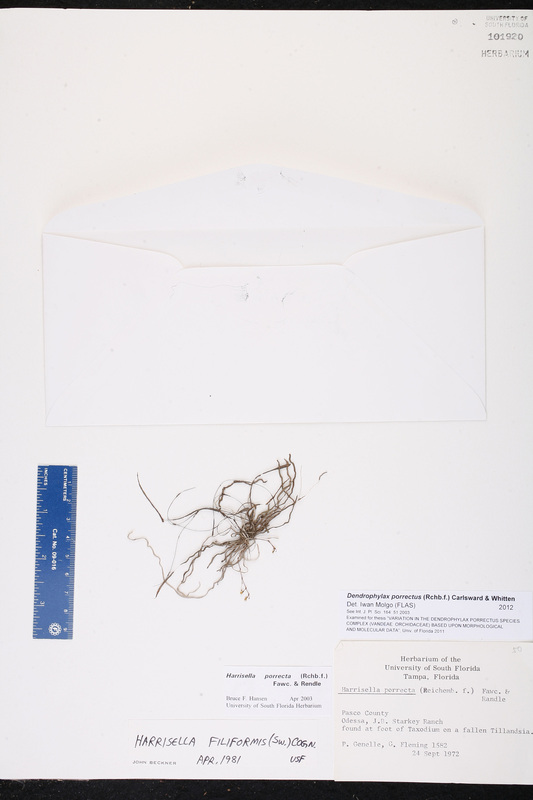 Notes: This specimen was originally on sheet #84019 in a separate envelope, and was removed and given another accession # in order to accommodate the different collection dates. 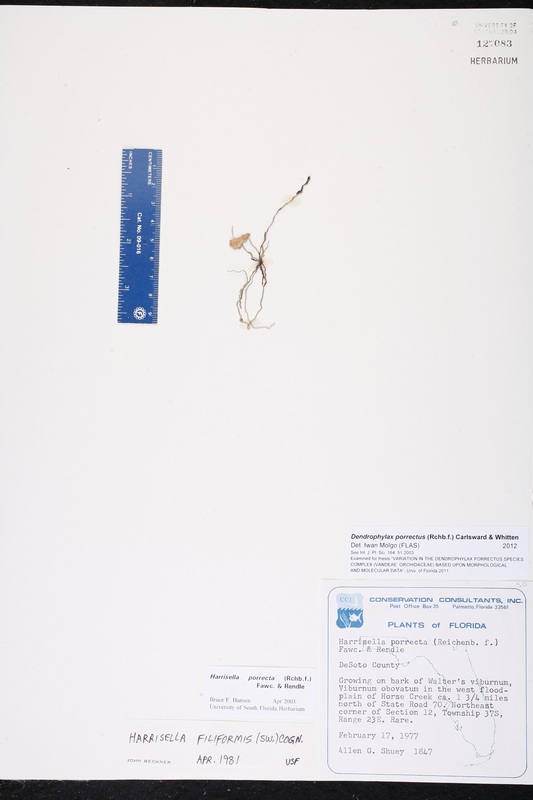 Locality: Florida, Pinellas Co., Contact USF Herbarium if additional information is required. 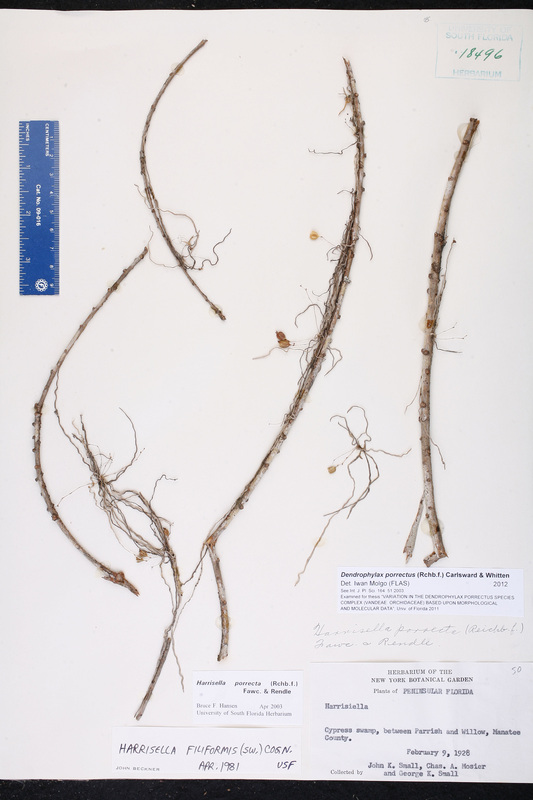 Habitat: On Juniperus silicicola [J. virginiana]. 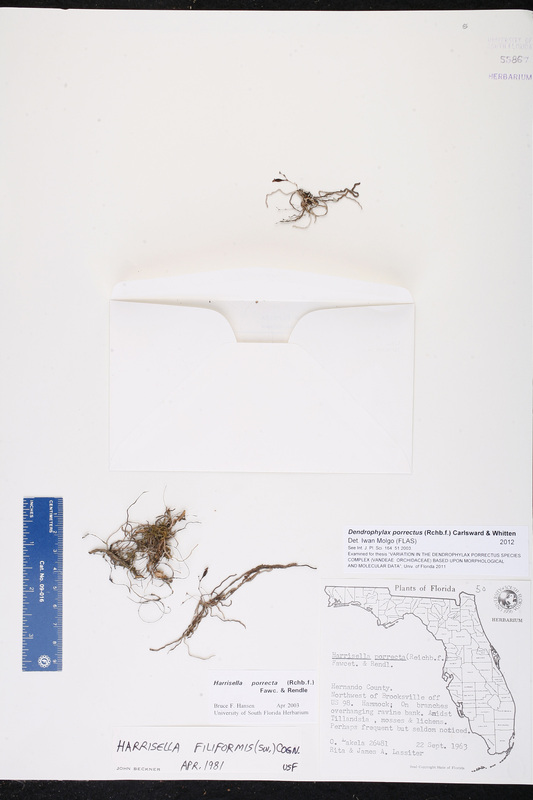 Locality: Florida, Sarasota Co., Contact USF Herbarium if additional information is required. 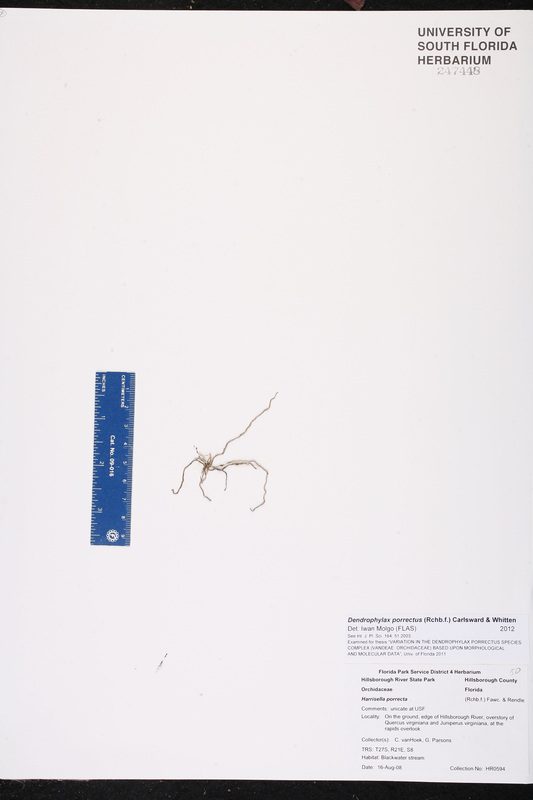 Collector: R. W. Long s.n. 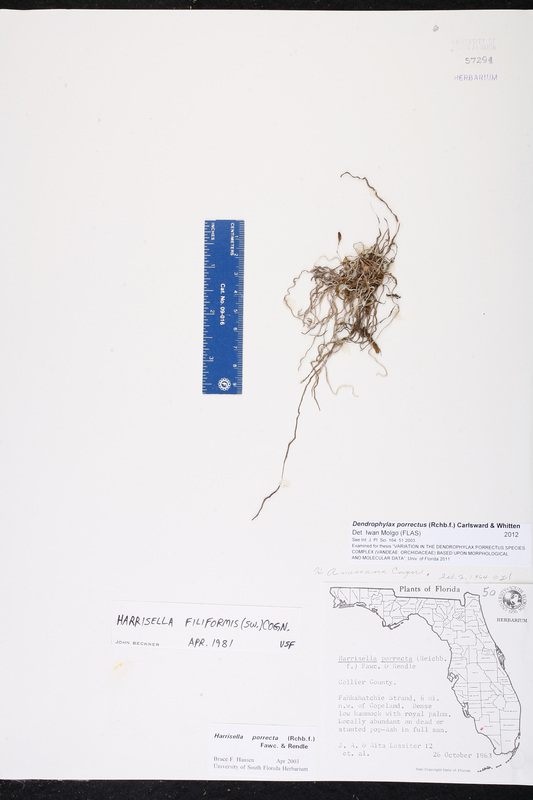 Locality: Florida, Manatee Co., Contact USF Herbarium if additional information is required. 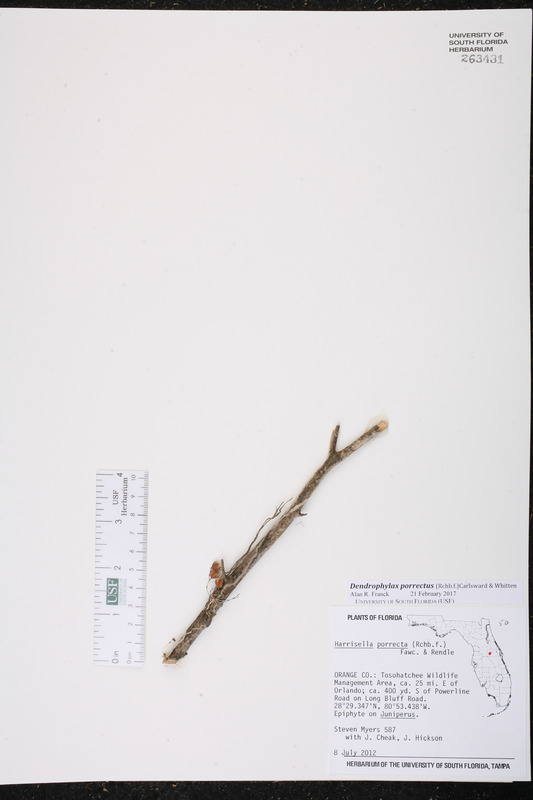 Habitat: Growing on pop ash (Fraxinus caroliniana), in wet hardwood forest. 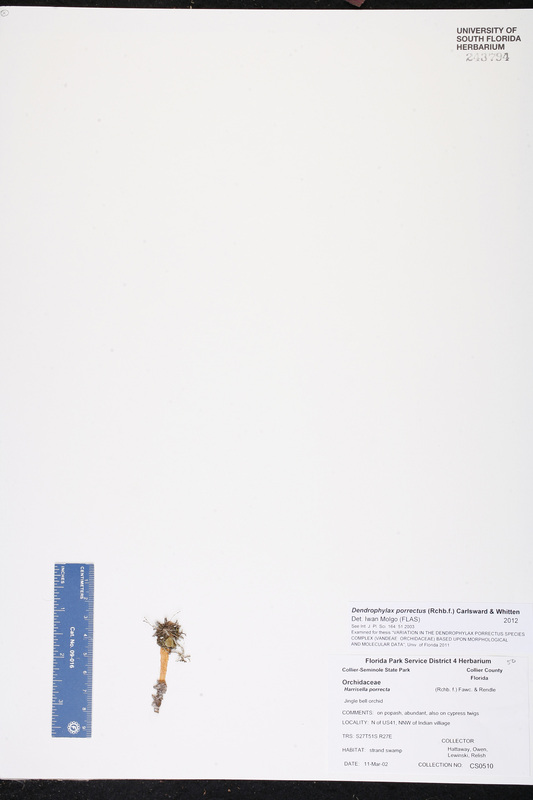 Collector: W. P. Stoutamire s.n. 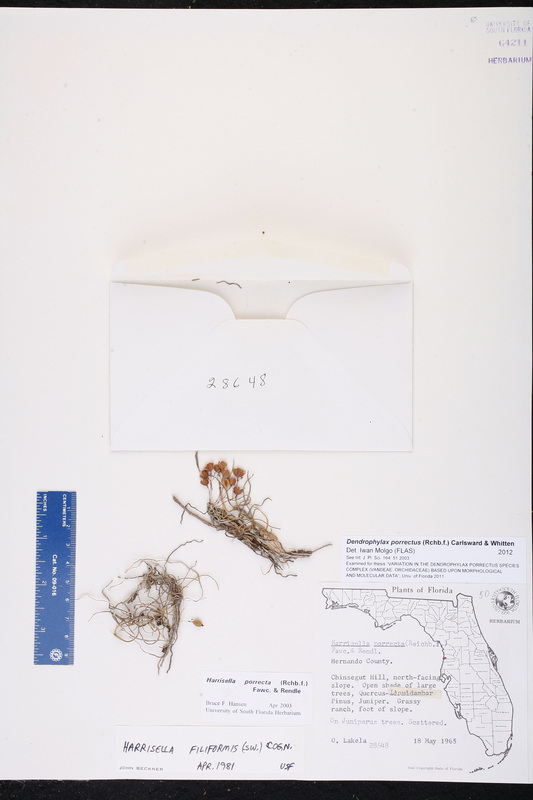 Locality: Florida, Pasco Co., Contact USF Herbarium if additional information is required. 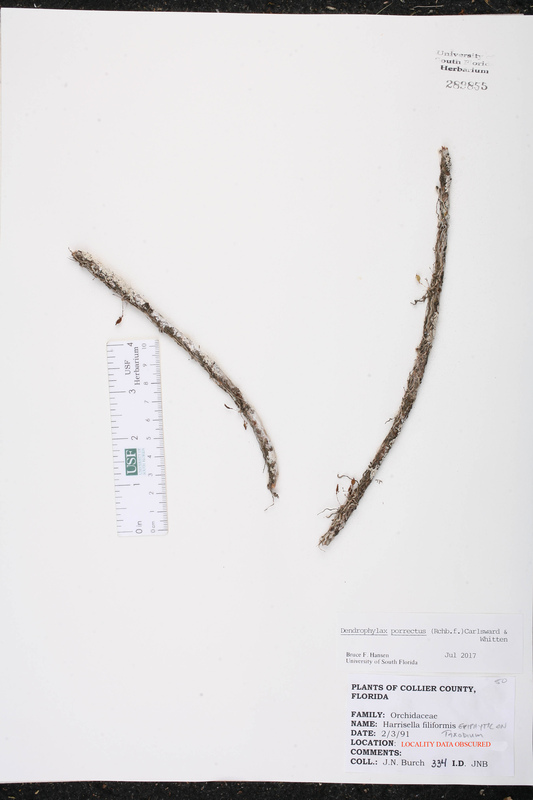 Habitat: Found at foot of Taxodium on a fallen Tillandsia. 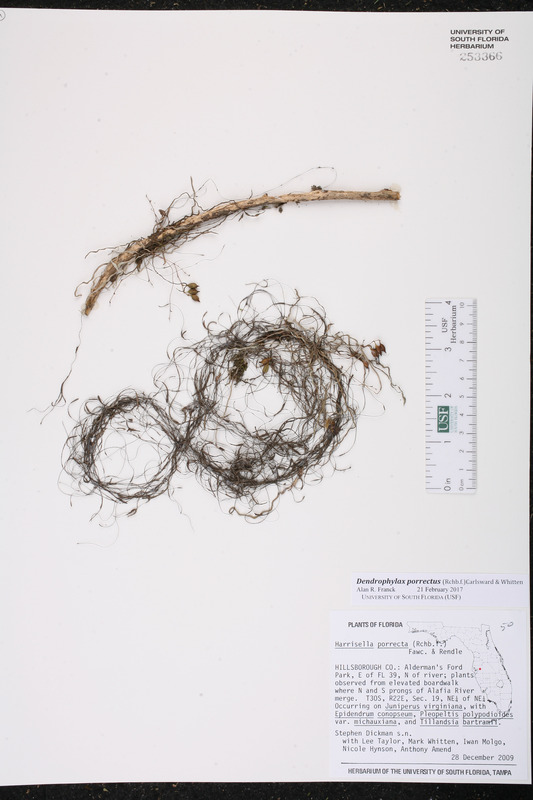 Description: On the ground [fallen]. 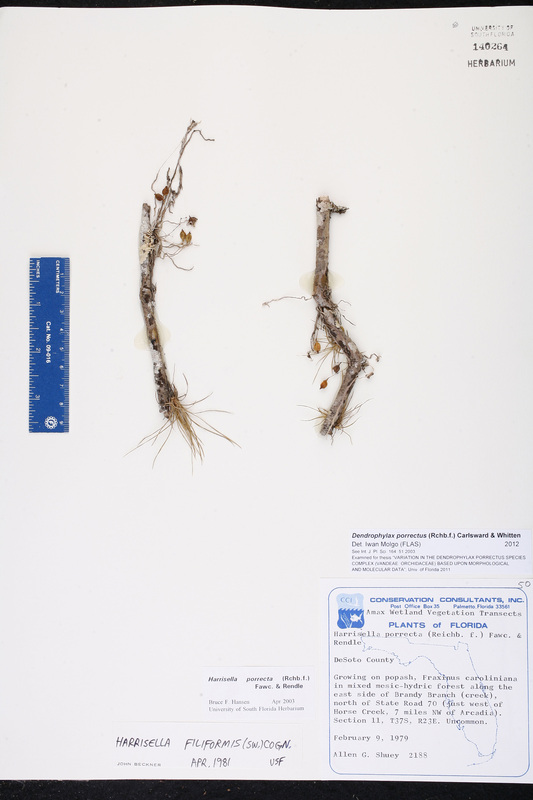 Habitat: Overstory of Quercus virginiana and Juniperus virginiana. 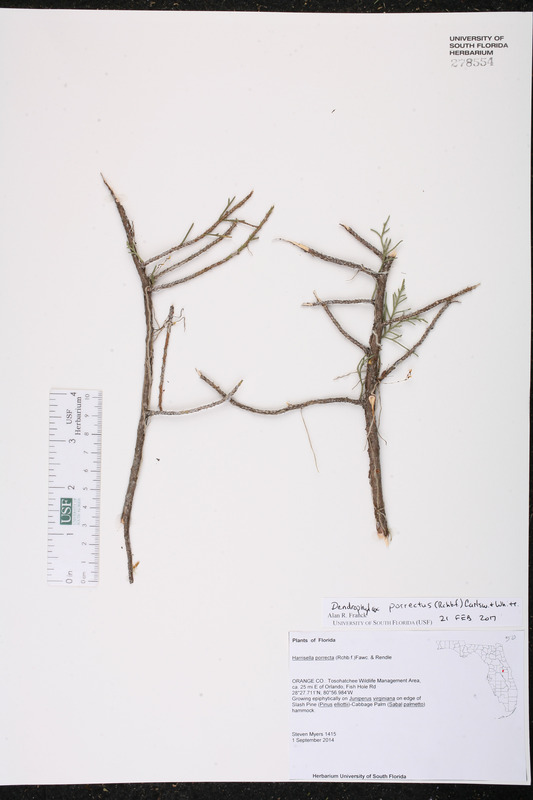 Habitat: On Juniperus virginiana; swamp.